Big Finish - The Music Volume 1: Big Finish Productions has released "The Music - Volume 1," a collection of music selections from their Doctor Who albums. More information is available at . Who Is Doctor Who: Mark Ayres is producing a new CD recording for release in November 2000 called "Who Is Doctor Who". The first volume of "Doctor Who-inspired pop records," the release includes recordings made by several Woh actors inlcuding Jon Pertwee, Frazer Hines and Roberta Tovey, as wel as pop music by the Go Go's, the Earthlings and Eric Winstone & His Orchestra. "Many television programmes inspire the record industry to put needle to wax," says Ayres, "but few do so to the extent that Doctor Who has done, and there is an enormous catalogue of disks celebrating (or affectionately mocking) the programme. The theme music itself is one of the most-covered in TV history (I've done it four or five times myself! ), and in compiling this disc we eventually had to limit ourselves to the period from 1964 to 1973, realising that, while we present nearly an hour of material, we have only scratched the surface. A second volume must surely follow!" A History of the Doctor Who Theme: Ayres has also presented a hefty research article on his website devoted to the history of the theme music. You can visit it at ourworld.compuserve.com/homepages/Mark_Ayres/DWTheme.htm. The John Nathan-Turner Memoirs: Also coming soon in audio format from Big Finish Productions (not as a book from Harper Collins as we reported before) is former Doctor Who producer John Nathan-Turner's memoirs. The two double-CD sets will feature a look back into JNT's mind at the making of his ten years on the series, plus his experience in television and what he's been doing since. Big Finish recently finished the editing on this and announced it for early 2001. 2001 Audio Releases: BBC Audio will be releasing two new CD sets in January 2001: "The Myth Makers," the audio track of the lost William Hartnell Season 3 story narrated by Peter Purves; and a CD of "Slipback," the Eric Saward-penned BBC Radio play from the 1980's starring Colin Baker, Nicola Bryant, Valentine Dyall and Jane Carr. Recently a major UK magazine has announced that "The Tomb of the Cybermen" and "Power of the Daleks" would be out later this year; however, Mark Ayres, who is producing many of the releases for the BBC Radio Collection, informed Outpost Gallifrey that this was completely incorrect. The Five Missing Books: As many dedicated Doctor Who readers in North America know by now, five Doctor Who novels from BBC Books have gone astray on the US release schedule: "The Ancestor Cell," "The Burning," "Heart of TARDIS," "The Banquo Legacy" and"Prime Time". After repeated checking, we have discovered that the release date listed by London Bridge is now April 2001. All five books were earlier released to specialty bookstores and some chain outlets (including some Borders and Barnes & Noble booksellers) that had specifically ordered them; however, after these initial releases, the distributor closed release of these books, and therefore, retailers are unable to reorder them (or chain bookstores and online bookstores such as amazon.com, order them in the first place). Overseas retailers (and overseas online shops such as amazon.co.uk) are unaffected, and it appears Canadian booksellers can still get them. Retailers who have copies (such as Ambrosia which does have copies of three of the books left) have them from their initial orders. 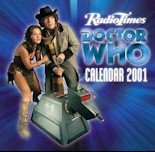 The BBC has been made aware of the April 2001 release date but at the moment is unable to get that date changed; the books are now unavailable to any and all retailers until that time. We will keep you posted when we receive further information on the release of these books. "Endgame" Note from BBC Books: BBC Books' Jacqueline Rayner asked us to post the following: "A number of people have been in touch to ask about the supposed cancellation of Endgame. So, to forestall any further rumours, this is what's actually happened... Amazon originally listed both of November's books as being written by Terry Nation (no idea why!). They have now corrected this, but it seems that in order to do so they 'cancelled' the 'Nation' books, to replace them with the correct listings - which means that they sent out cancellation notices to anyone who had preordered the books. So there is no crisis - the books will be out as normal, and they are now listed on Amazon under their correct authors. If you have any queries about your preorders, please contact Amazon. Thanks to everyone who brought this matter to our attention." Missing Episodes Won't Cost You: A note to any prospective buyer for "missing episodes" of Doctor Who... don't do it. Recently, several online auctions have turned up so-called 'missing stories' being sold. These are almost certainly hoaxes; anyone with access to the Internet and knowledge of Doctor Who would be aware that such episodes could be considered valuable commodities. If you have come across such auctions of missing material, we suggest you visit the Restoration Team who have legitimate ties to the BBC to investigate. It is very, very unlikely that anything else exists that could be easily sold on any of the auction sites.